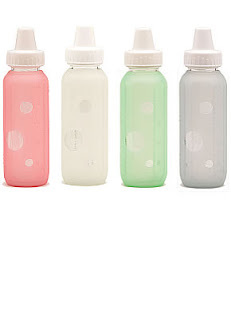 Silikids Siliskin Bottles - $6.00 8oz./$5.00 4 oz. - 50% off the $12.00/$10.00 retail prices! These glass baby bottles come encased in a colorful Siliskin, made by Silikids, so baby can grab, hold and avoid slippage when feeding. Microwave safe, hypo allergenic and dishwasher friendly, the translucent silicone sleeves allow you to see measurements and liquid in the bottle. Cleaner than any plastic, parents-in-the-know realize that glass bottles are the best. Available in two sizes: 4 oz. and 8 oz. -Siliskins are made from silicone, which is hygienic and hypoallergenic. Its rubber like material is safe, durable and pliable, and there are no open pores to harbor bacteria.